We all know that Location matters, but often the next most important factor in determining Real Estate value is size, and boy, does size matter! Your SF has an incredible impact on your Real Estate holdings and in different ways than you may expect. 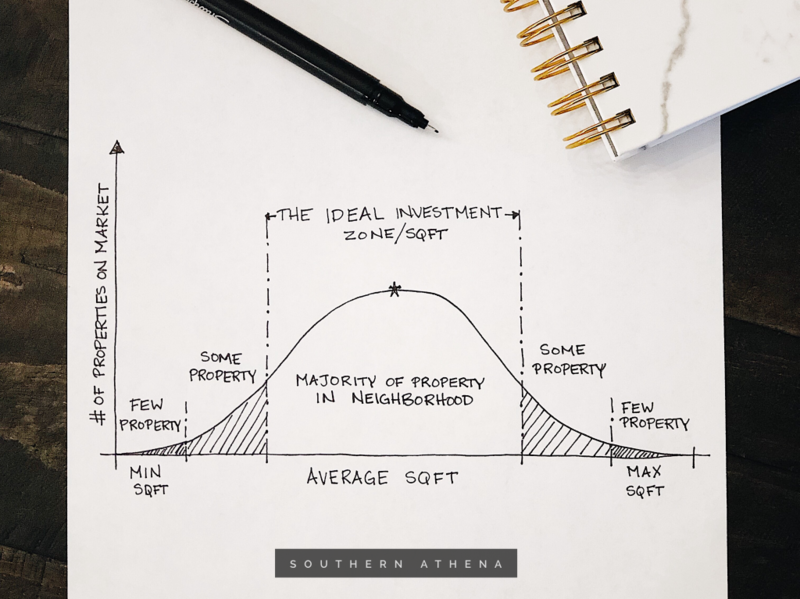 Let’s take a look at the 4 primary ways to assess property value based on size, and how they impact your bottom line for investment. Many people looking at price of Real Estate will consider value in terms of $/SF. If it is not readily apparent, it is important to calculate this so that you can compare apples to apples. If you are looking for a good deal, you should be considering price per square foot with the intent to get it as low as possible compared to other properties. And just as if you are shopping for high quality produce at a supermarket, when evaluating Real Estate, you would consider price per SF as an indicator of Real Estate Quality. Your average Real Estate professional will often use a simple Price / SF analysis to determine the list price of your property. We know this is not enough. Simple $/SF calculations are one of the many pitfalls of the automated “Estimates” you may be receiving on your property. They can not and do not take into consideration the unique features of your Real Estate. For example, if a tear down in your neighborhood is included in a $/SF Comparable Market Analysis (CMA) average, but your home is in great condition, that analysis would likely give you an artificially lowered valuation. And on the other hand, if you have not completed any updates or have deferred maintenance on your property but all of your neighbors’ are in pristine condition, a simple CMA would give you an artificially inflated idea of what your Real Estate would realistically command on the open market. Contact Us today for a customized CMA and market analysis. We base our pricing recommendations on more than Price / Sqft alone to ensure you are not leaving money on the table or listing above market with no sale in sight. The savvy investor understands that not all SF is created equal. Beyond quality considerations as described above, the biggest missed consideration in analyzing Real Estate price and size involves Design. Quality Design is just one of the many reasons we are able to create so much value for our clients at Southern Athena! We integrate our Architecture and Interior Design Expertise into all of our Listing strategies. Many times we have toured similar sized properties and they have different layouts that affect their perceived value. You can walk through different properties or units with similar SF and all will likely feel very different in size. Usable space, natural light, proportions and flow will have a significant impact on perceived value and use. This is just one reason it is so important to compare Real Estate in person. You never really know a space until you experience it yourself. We can’t count the times we have seen photos online only to walk into a completely different space. 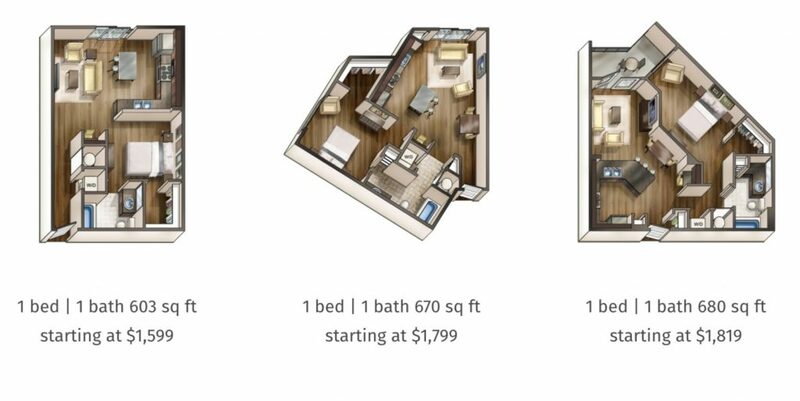 Example shown below of a location with similar square footage but different pricing for different layouts from Pine Street Flats in The Gulch neighborhood of Nashville, TN. And just because your Real Estate has a certain size, doesn’t mean it is all equally valuable Square Feet. That attic or basement addition isn’t going to be as valuable as your kitchen and living space. A room with a window unit isn’t going to have the same Price / SF as the space serviced by central HVAC. Weird layouts, unusable areas, room scale and functionality all have an impact on the value of your SF. You can understand why we cry a little inside every time we see an addition or remodel that cost someone $150 / SF in construction, but wasn’t designed by a professional with ROI in mind. That poor owner is losing a ton in wasted money, resources and time! We promise the cost of quality design far out weights the cost of creating more space just for the sake of creating more space. Just check out the data for common Home Remodeling Costs vs. Value for Nashville in 2018! When you go to Sam’s Club or Costco, why do you think the prices are so low? You are getting a bulk discount for buying more! If you look closely at Real Estate pricing in terms of size, there is a scale factor to consider. When selling a 1,100 SF Commercial property, our Price / SF was astronomically higher than competing properties in the area with 2,500 SF. At a certain threshold you pay a premium for smaller spaces, and get a discount for larger spaces. One strategy we use to analyze Real Estate income and cash flow projections is to consider suite sizes and scales in proportion to their specific price per SF. If an owner can get 1.5X the income with smaller suites, and there is a demand for it, we can then charge a premium (a missed opportunity by our competitors without being able to ensure the Architectural feasibility of these decisions). If a Landlord wants fewer tenants, then we help them offset the lower rental rates with longer leasing terms, lower property management and brokerage fees, and risk mitigation. Have you ever heard you shouldn’t Buy the largest home in the neighborhood? You also probably shouldn’t invest in the smallest unless you plan on adding on. Real Estate has the highest competitive advantage in Price when the Size of the property is in the middle of the pack compared to the local competition. We often notice a simple bell curve when analyzing pricing strategy in terms of size trends and location. That is because like attracts like. Buildings of similar size are often located in clustered areas. This happens for many reasons – zoning, planning, demand, and competition. When your Real Estate is of similar size to those around it, you have likelihood of attracting more Buyers looking in that market compared to those properties with outlying sizes. Staying close to your competition will give you a huge advantage making money in Real Estate. One reason we excel so much at Selling Real Estate is because we take size, competition, design, scale and location into consideration when analyzing your property for its highest and best value. Contact us today for a strategic Analysis of your Real Estate holdings and learn how to uncover the hidden value in your Real Estate through our integrated approach to Investing. 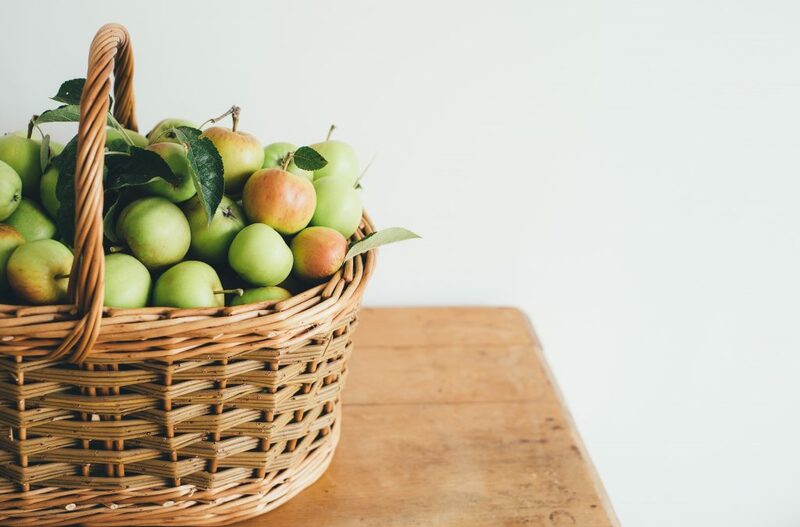 Thank you to the following for use of their images: Annie Spratt for her Apples to Apples photo and Klaus Tan | Chuttersnap for his Aerial Neighborhood photo!